You said edible and I said … FRUIT! I’m not sure why, but fruit is my favorite food for shooting. Also eating. It’s neat and shiny. Maybe that’s why. You can pile it up, spread it out … and then, you can eat it. This time of year, there’s not much of it on the market. The local fruit vendors have nothing to sell. There won’t be anything for a few more months. The stuff from California is not great, but … we have tangerines. They are the saving grace of fruit during the long winter. Here are some tangerines. Orange. I need to mention that taking pictures of fruits and vegetables is more difficult than it seems. I’m not sure why, but when I sort through all the pictures, only a few are good enough. That might be one of the lessons we get from photography. Easy things are not necessarily as easy as they appear to be. CARING IS SHARING. PASS THE KLEENEX. Does it show how much I love my husband that I gave him my cold? Maybe he gave me his cold and he didn’t know it because he was incubating. Maybe we both picked it up in the grocery store … or our doctor’s office. Did the Russians hack my sinuses? These are the kinds of questions with which I struggle. I used to be so passionate about juice I actually couldn’t imagine life without it. But, I live without it. Funny what you can get used to when you have no choice. I do eat fruit. Mostly, in season, One day, I will probably overdose on fresh cherries in season. Right now, I’m working on a tangerine overdose … but I tell myself that vitamin C can’t be bad for me, right? I grew up in a small town in a big city. Holliswood was sort of rural. We had farms. Chickens. Goats. Horses. And were walking distance (okay, a very long walking distance) from the subway. I thought it was the perfect place to grow up and I haven’t changed my mind. I wrote a book. If you really want to know, you are welcome to read it. The answer to this question is way too complicated for this post. The 12-Foot Teepee is available for Kindle and in paperback. From Amazon. Watching murder mysteries and guessing who done it before the credits have finished rolling. Laughing. At anything for any reason. The dogs. Because they are everything, all wrapped in furry little packages. Author Marilyn ArmstrongPosted on 01/28/2017 01/28/2017 Categories Humor, Personal, PhotographyTags Fruit, humor, Personal, Relaxation, Share Your World27 Comments on CARING IS SHARING. PASS THE KLEENEX. WHAT ARE THE DOING TO OUR FRUIT? Fresh fruit. I’ve become phobic and afraid of it. So much of it has been genetically modified. It doesn’t look like it used to look. Oranges bigger than grapefruit, but the orange skin is half an inch thick and there’s no juice in it. Strawberries the size of plums, mushy and oddly tasteless. Peaches that weigh a pound each, as sweet as cardboard with the same texture. Those weird fruits also rot pretty much immediately, before a single day passes. So far, they’ve left a few things alone. As far as I can tell, grapefruit and tangerines are still safe. But I won’t buy most fruit except at local farm stands. It’s like consuming an alien invader. Who knows what that stuff will do to you? Author Marilyn ArmstrongPosted on 07/03/2015 07/02/2015 Categories Food, Photo A Week Challenge, Photography, PostadayTags Fruit, oranges, photo a week, Photography, postaday, strawberries43 Comments on WHAT ARE THE DOING TO OUR FRUIT? 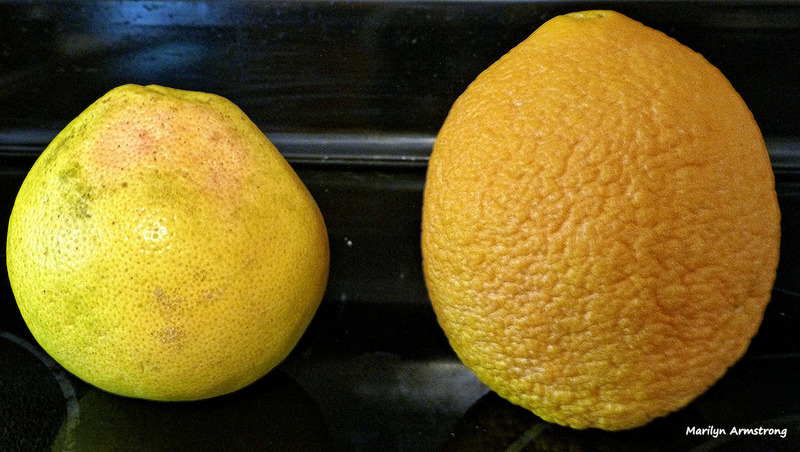 I while ago, I wrote about how oranges were now larger than grapefruit. The change has occurred rather abruptly. Although the oranges are huge, they aren’t sweeter or juicier. Most of the larger size is an enormously thick skin. And the oranges go bad and rot in record time. Oranges used to keep for weeks when refrigerated. Now, they last a couple of days at best. Many don’t last that long. They’ve already done in the strawberries. Whatever those huge soggy red things are they are foisting off on us and calling strawberries? They have less taste, aren’t sweet … and become inedible almost immediately. Between buying them and them rotting is no more than a few hours. The next fruit to get hit were green grapes. They appeared at Hannaford in April. Huge. They are firm when you buy them, but turn mushy in hours. At best, they are peculiarly tasteless. They haven’t ruined the red grapes yet, but I’m sure they’re working on it. I told Garry that the best way to judge whether or not they have messed with the genetics of the fruit or vegetable? if it looks too good to be true, it’s is. So what’s next? The cattle? Sheep? Bet they are already doing it. How about dogs and cats? Perfect specimens that can win “Best In Show” every time, but are oddly vacant and lacking personality. How about children? No more problems trying to keep them from misbehaving in school. They’ll be very well-behaved, all the time. Because we’ll engineer the mischief right out of them. What could go wrong with that? I am convinced that this is the way the world ends. They genetically change our food. Eventually, genetic meddling with some kind of animal or vegetable produces an unexpected result and people start dying. By the millions. All over for humankind. And we will have done it to ourselves. It’s weird how something suddenly makes me realize how much the world has changed and not in a good way. Yesterday, I went to the kitchen to cut up an orange and a grapefruit. It’s a low-calorie healthy snack, right? I cut up the orange, dumped the sliced into a bowl. Then I cut up the grapefruit and put it into a bowl with the orange slices. Whoa! I took a second look The orange slices were bigger than the grapefruit. Not a little bit bigger. A lot bigger. When did that happen and what have they done to oranges? Last summer, the strawberries got huge. They were closer to the size of plums than berries. Surprisingly tasteless, too. Somehow, I doubt it’s a natural mutation. They are messing with the fruit. The grapes also got enormous last season and didn’t taste right. I won’t buy them anymore. What was wrong with the old grapes? They were entirely big enough and tasted delicious. Meanwhile, my doctor thinks I might want to smoke dope and it’s actually legal to do it. How ironic that I am less surprised by the gradual legalization of marijuana — its morphing into an all-purpose drug along the lines of aspirin — than I am by the genetic meddling going on with the food I eat. I don’t even know what’s in my food anymore. Is it still nutritious? Or is it a lethal time bomb? Probably I don’t want to know the answer to my questions. It would just alarm me. I was 46 years old when my homemade strawberry preserves jelled properly. Probably what broke the barrier was overcoming a longstanding aversion to putting sufficient sugar in the mix. Alternatively, I could have solved the problem by adding tapioca starch or pectin, but I’m a a bit of a food snob. I wanted my preserves made of just fruit and sugar. The day the preserves came out perfectly was the day my first husband finally died. He had been dying for a long time. It was a Friday, a rare brilliant spring day in New England. Jeff had been sick for almost a year, in what we politely called a coma, but which was actually a vegetative state. Now gone. I had not come to terms with it though I’d certainly had plenty of time. Probably no amount of time would have been enough. Other than Jeff’s dying, it was a good time. Garry and I were happy. We were good together, busy with career and friends. Yet there was that underlying sadness we could not avoid, the knowledge that a death was near at hand. Happiness and sadness don’t cancel one another. The good things are not a balance against pain. Feelings aren’t an equation. You can’t add columns of positive and negatives in your life and come up with a number in the middle. In the real world, joy and misery cohabit. We live with both together. Emotions are messy. I married Jeffrey at 18 and thought myself very mature. He was almost 30, but he thought me very mature too. Both of us were wrong. Yet we muddled through. We were hard triers. When we had no idea what to do, we faked it. Eventually, we became the people we had long pretended to be and it turned out, not the people we needed to be for each other. Though we went in different directions, we stayed friends. No matter where on Earth I was, I knew Jeffrey was there for me. We had a better divorce than most marriages. Decades passed. Jeff’s health deteriorated. He survived things that should have killed him, so what a shock he should die of the thing that was to extend his life. The heart surgery should have given him years, decades. When Sue called late on an August evening reality upended and everything screeched to a halt. No, his body wasn’t dead, but his brain was. The future world would be without Jeff. I would never call to tell him something funny that happened, hear his sarcastic, drawling response. It wasn’t supposed to be this way. Someone rewrote the script when our backs were turned. Fall passed and winter too. Jeff remained in a vegetative state. Someone who looked just like him was wearing his body and that shell remained alive through the seasons. We visited. I stayed for weeks to help care for him. Finally, as spring was nearly summer, the piper played. And now, the ashes were scattered. Just the other day, Garry glimpsed a someone in a crowd who looked just like Jeff.